A chunky board book retelling the beloved fairytale for very young children. Little Red Riding Hood is on her way through the forest to visit her grandmother, but meets a big, bad wolf instead. With robust tabs to help children locate their favourite scenes. Very simple text accompanies each picture making this book perfect for reading aloud to young children, or for children who are just beginning to read to tackle alone. This is a series I absolutely LOVE! 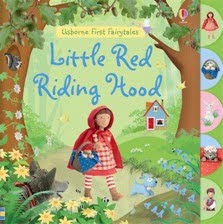 Usborne First Fairytales are sturdy, easy to handle and have gold glitter accents on the pages. They are worth every penny you spend for them and will be the longest lasting on your shelves. Who wouldn’t love this classic fairytale with wolves and little red in vivid color? 5+ stars from our family!